The move followed reports by the Senate Committee Chairman on Public Accounts, Senator Mathew Uroghide indicting President Muhammadu in the purchase of American Tucano Aircraft worth $496 million without the approval of the Senate. Uroghide submitted that his committee grilled the Minister of defence to that effect in line with the mandate given to his committee. He also confirmed that the Minister of Defense, Mansur Dan-Ali had admitted wrongdoing in the purchase of the aircraft. Uroghide added that it was not the first time, Mr. President was committing an impeachable offence. Senator Chukwuka Utazi, Enugu North Senatorial district seconded that Mr. President has committed an impeachable offence, hence, he should be impeached. 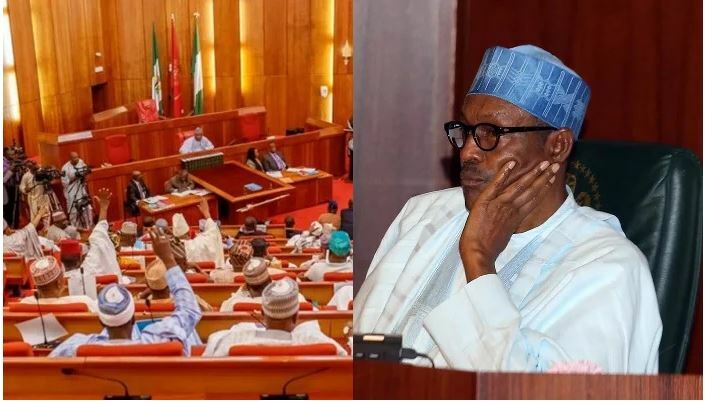 He was saddened that Buhari continued to dispense huge sums of money without regard to the Senate and the constitution, saying he clearly breached section 80. He further explained that the purchased aircraft would be delivered in 2020. Shehu Sani representing Kaduna Senatorial district admitted the high level of insecurity the nation is experiencing. He suggested for the recall of the funds for due process to be followed instead of impeachment. Senator Abu Ibrahim in his contributions took the Senate through national accountability, stating that APC led government has been very open. He urged the Senate to focus on how to assist government to tackle insecurity. Senator Samuel Anyanwu representing Imo East insisted that the breach of the constitution by President Buhari was beyond party and friendship, stating that the substance of Buhari’s action must be looked into. He recalled that late Senate President, Dr. Chuba Okadigbo was removed from office based on anticipatory budget. He called on the Senate to invoke section 143 of the constitution, saying Buhari should be impeached. Senate President, Dr. Bukola Saraki recalled the United States Congress meeting with Nigerian parliament over the purchase which President Donald Trump sought the American Congress’ approval. “It was after our meeting in August last year, that they went back to approve Donald Trump’s request,” he said. The Senate President added that there was ample time for the executive to write to the National Assembly for approval. He, therefore, referred the motion to the Senate Committee on Judiciary, Human Rights and Legal matters to weigh the legal implications and report back on Wednesday next week.